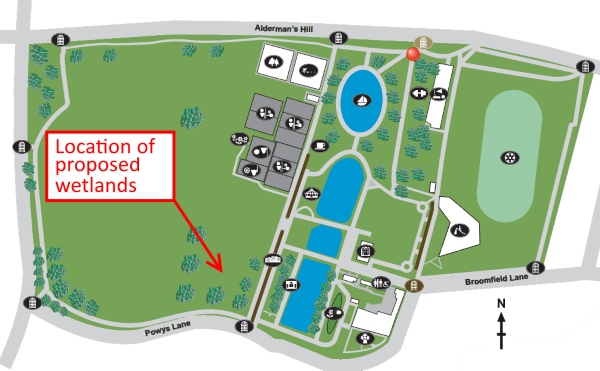 In response to concerns about the amount of land in Broomfield Park which is currently fenced off for construction of the wetlands scheme, Enfield Council has issued an assurance that the finished scheme will occupy only a small proportion of the land that is closed to the public during the work. The concerns were raised by Fox Lane & District Residents Association (FLDRA) and the exchange of messages is reported in a recently issued FLDRA newsletter. See the extract below. "Local residents have been concerned to see such a large area of the parkland dug up for the Wetlands scheme and don’t understand that the actual planned Wetlands area is only a small part of it - they are worried that nearly all the south western corner of the parkland which is currently fenced off will be part of wetlands area and this will reduce the area of parkland available for dog walking, having picnics etc. There have also been concerns expressed that the new avenue of trees from Powys Lane leading up to the House, which was only planted a couple of years ago at considerable expense, might be damaged by the diggers and other vehicles using the site." "I appreciate the concern raised. However I can reassure you that the footprint of the wetlands once finished is a small proportion of the site at the moment. The fenced off area includes the spoil disposal area and forms a large part of the site. The reason for this is that we are aiming to spread the spoil at the lowest possible height to reduce the impact once complete. The process for this was to strip topsoil from the spoil area before grading in the subsoils, before re-covering with the original topsoil. "When finished the area of spoil will be restored to grassland. And the visual change should be barely detectable. Obviously after this reparation will take a few months after the job has finished, during which point a fence will remain in place. 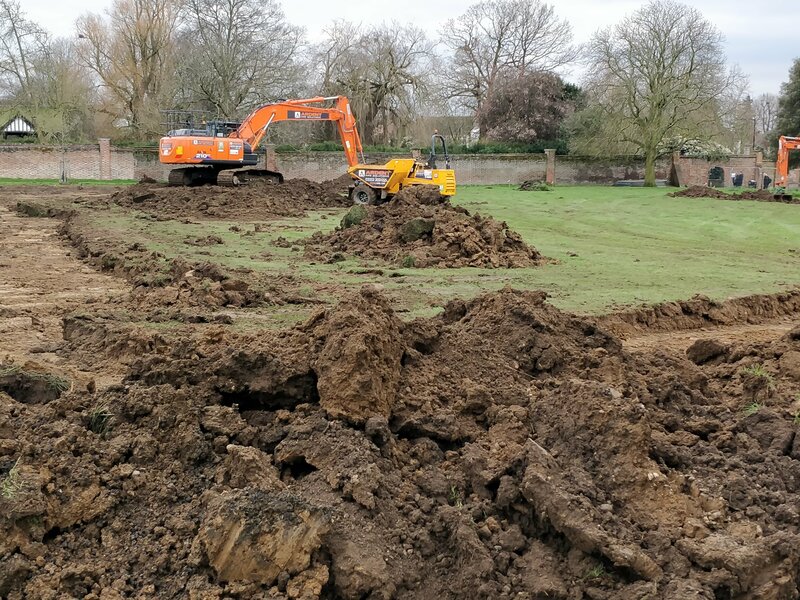 "I am currently working on a landscaping plan but will not be able to have it ready for the 10th April I’m afraid, however if there are any concerns I will be happy to hear about them. "I would only echo your sentiments in the last paragraph that the building phase of these projects is the most unsightly – whereas the final result we are going for is a lot more pleasant." Further information about the wetlands scheme on the Friends of Broomfield Park website explains its aims and benefits and how it is funded. The finished scheme will occupy only the rectangular area delineated by the trees in the plan shown here.